With Microsoft Word, you can edit PDF files out-of-the-box with no additional tools needed. We’ve taken a few screenshots of the process including a groovy video demonstrating the PDF Reflow feature. Every working professional comes across PDF files on regular basis. Sometimes you need to get content from a PDF file or make changes to it. 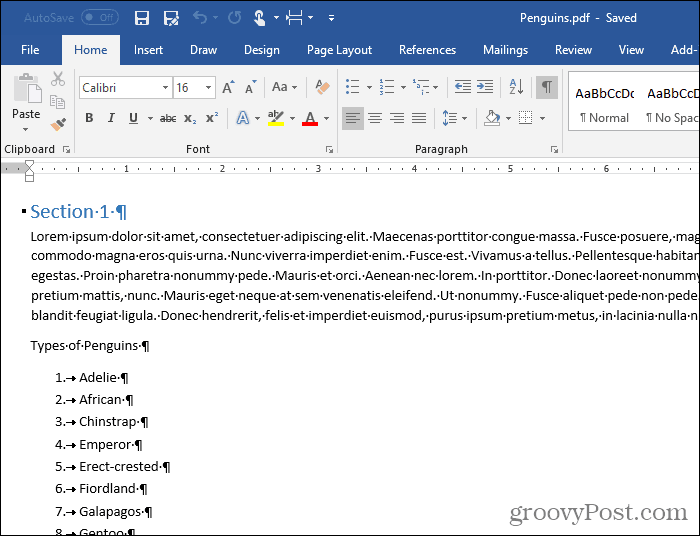 One way to edit a PDF file is to convert it to a DOCX file using Word’s PDF Reflow feature. When you try to copy anything from a PDF file and paste it into Word, it pastes the text, but you lose all the formatting. 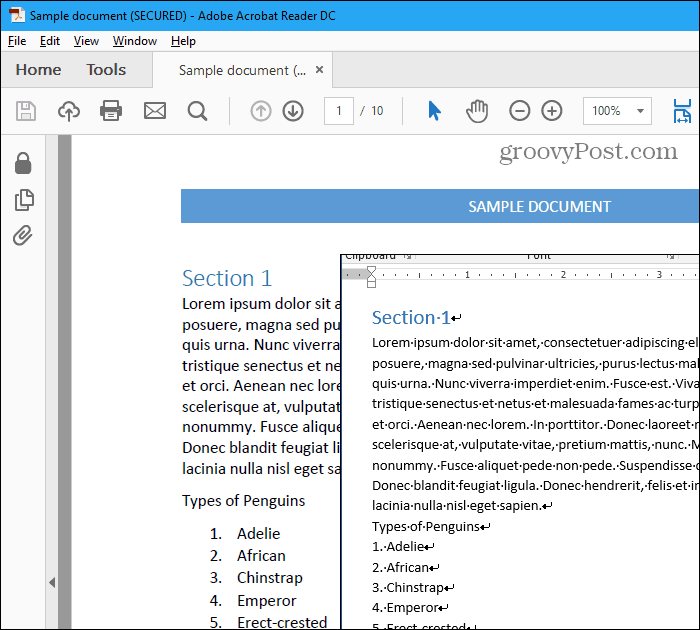 PDF Reflow allows you to convert PDF content to a Word format and keep the original formatting. You can avoid using any third-party converter or Office add-on. To get started, open any PDF file you want in Word. You’ll see a warning message saying Word will convert the file and it may take a while. Click OK. If the PDF file is password protected, Word asks you for the password before opening the document. Enter the password and click OK.
Word shows the content in the same format as the original PDF, and you can edit it and copy all or part of it. If the PDF is larger than just a few pages, it may take Word a few minutes to open the file. To save the file as a DOCX file, go to File > Save As. Choose a location and make sure Word Document (*.docx) is selected from the Save as type drop-down list on the Save As dialog box. Then, click Save. You can also export Word documents to PDF files, web pages, and other formats. 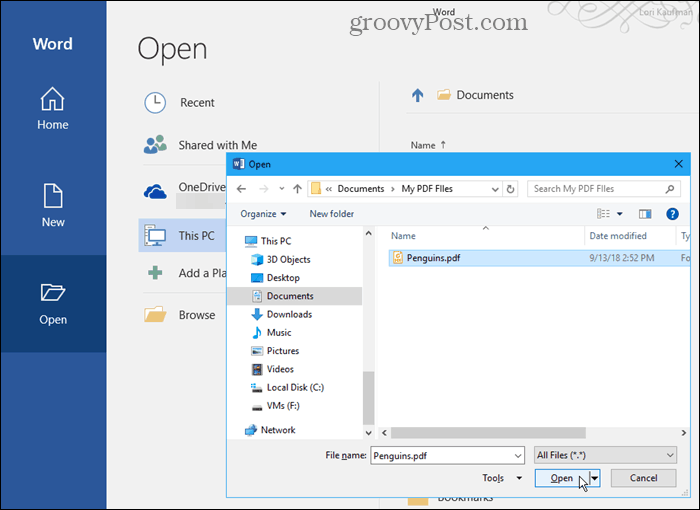 Learn more about working with PDF files in Windows 10. Just tried it. Great and really useful stuff. Worked pretty fast, too. Yeah it’s a great new service. Probably going to put a few online businesses out of business. I wonder how much Microsoft had to pay Adobe for the license. From a PDF standpoint, It’s a game changer. If I get it correctly, you can develop software that reads and writes PDFs for free. http://partners.adobe.com/public/developer/support/topic_legal_notices.html Interesting, isn’t it? Oh wow! This is huge man. When I worked in IT the business dept always wanted to do this and we had to purchase Adobe Acrobat for all the seats…this is a reason to move to 2013 alone. Oh yeah, cost savings and just a simplified workflow. Very nice update!